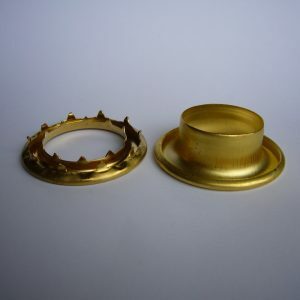 All our grommets and washers are manufactured in brass. All can be plated in various colours. Our eyelets, rings, grommets and spur tooth washers are used widely within the marquee and temporary structure industry, that includes tarpaulins, gazebos, tents, yurts and lorry sides. Our eyelets, rings, grommets and spur tooth washers are manufactured in our UK factory, in a good quality brass, free from rusting and made to last. With our brass washers & grommets, a strong, slip free hold is guaranteed.